This month’s Charcutepalooza challenge suits me just fine. 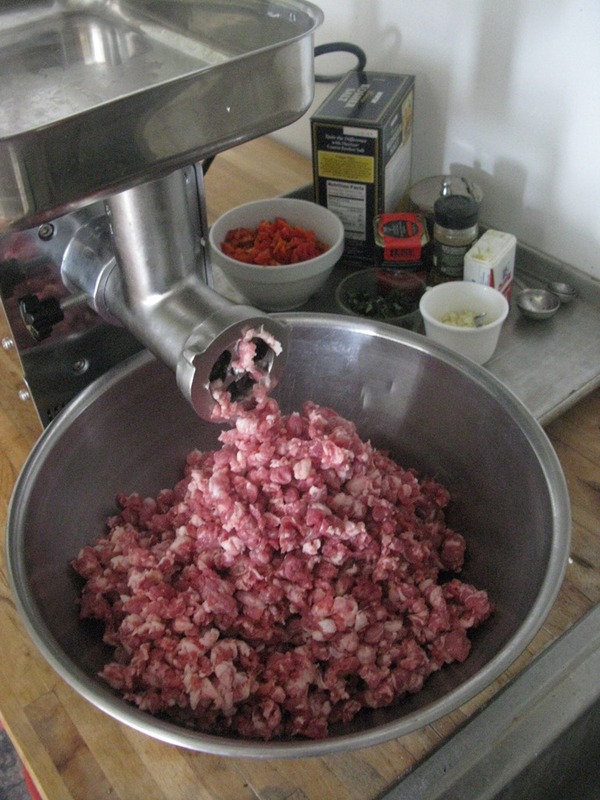 I like nothing better than grinding meat and stuffing sausages. I chose to make merguez–the classic Middle Eastern sausage with roasted red peppers, smokey Spanish paprika and a bit of heat from red pepper flakes–because I’d never tackled it before. Mergues usually comes out looking more like breakfast links, stuffed into lamb casings. But I didn’t have any lamb casings, so we ended up with monsters like the one you see in this photo. But who’s complaining? 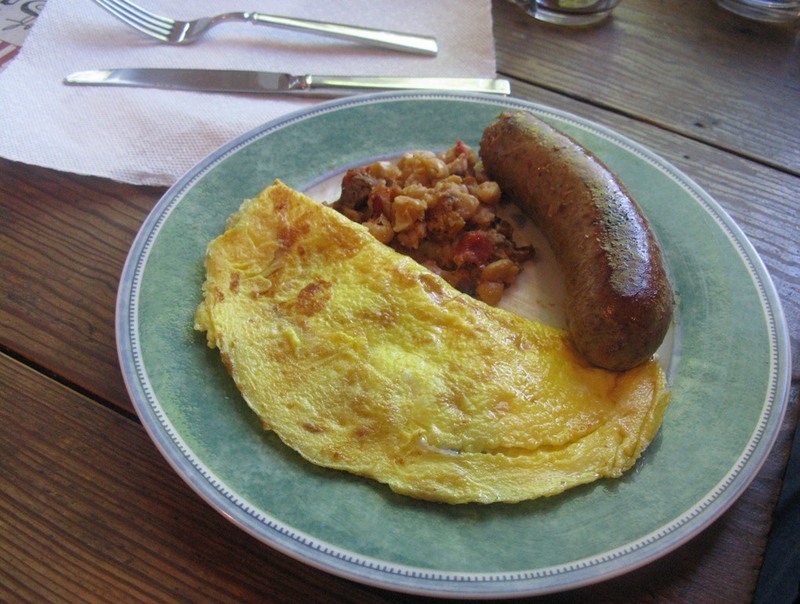 This made a terrific breakfast, along with an omelet stuffed with our favorite goat cheese and some leftover cassoulet on the side. I purchased lamb shoulder for these sausages from my favorite local vendor, Bev Eggleston of EcoFriendly Foods. He has a stall at the Dupont Circle farmers market on Sundays where he displays a huge selection of various beef, pork, lamb and poultry products. A 5.13-pound cut of lamb shoulder cost me $43. When I removed the bones, I had 3.5 pounds of actual meat, making the price $12.28 a pound. That makes local lamb quite a bit more expensive than the boneless shoulder they were selling at Whole Foods, where the price was $7.99 a pound. Is it worth it? I let readers ponder that question. 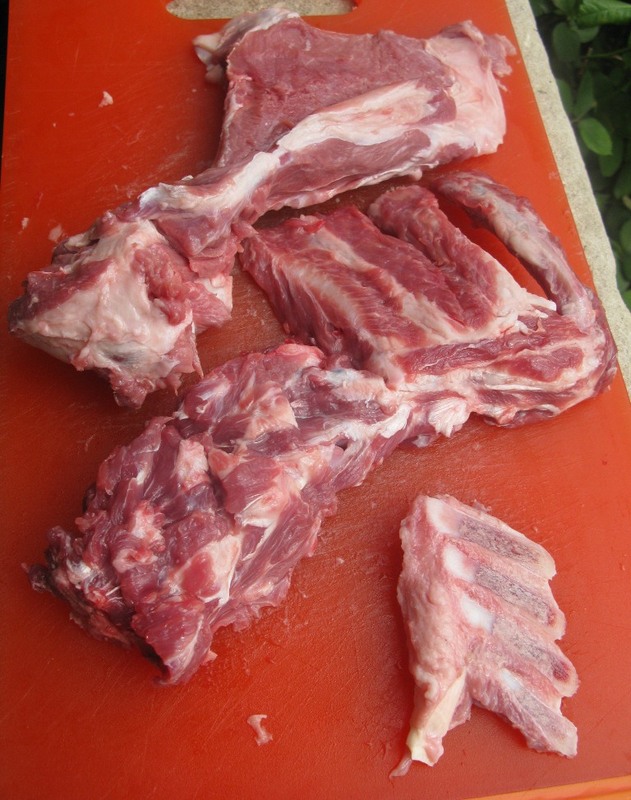 If you purchase a bone-in shoulder, you will have some butchering to do. But on to the sausage. The recipe in Michael Ruhlman’s Charcuterie calls for 4 pounds of lamb and 1 pound of pork fat back. I didn’t have the fatback and substituted pork shoulder, which seems to work just fine. Since I had less than four pounds of the lamb I just made up the difference with more pork. With the meat and my grinding tools very cold, I ground the meat roughly, then mixed in 3 tablespoons kosher salt, 2 teaspoons sugar, 1 teaspoon red pepper flakes, 2 tablespoons minced garlic, 1 1/2 cups diced roasted red peppers, 1 1/2 teaspoons ground black pepper, 2 tablespoons Spanish paprika, 2 tablespoons minced fresh oregano. Pass this mix through the grinder again with a small cutting disc. Again, everything should be kept very cold so that the fat in the meat doesn’t gum up the works. Then, using your hands, mix in 1/4 cup dry red wine and 1/4 cup ice water. At this point, you would normally stuff the meat into lamb casings to make links, but I used pork casings. You can also simply form some of the meat into patties and fry it like breakfast sausage. Use your imagination. We’ve tried it both ways for breakfast and lunch. But I could easily see the links grilled for an outdoor feast with asparagus and a zesty salad. That looks like the best breakfast ever! My favorites, goat cheese and lamb! It’s true, Carrie. I am schedule to give a kids cooking demo at the fair. I will try to work the butchers into the trip. Thanks for the tip.